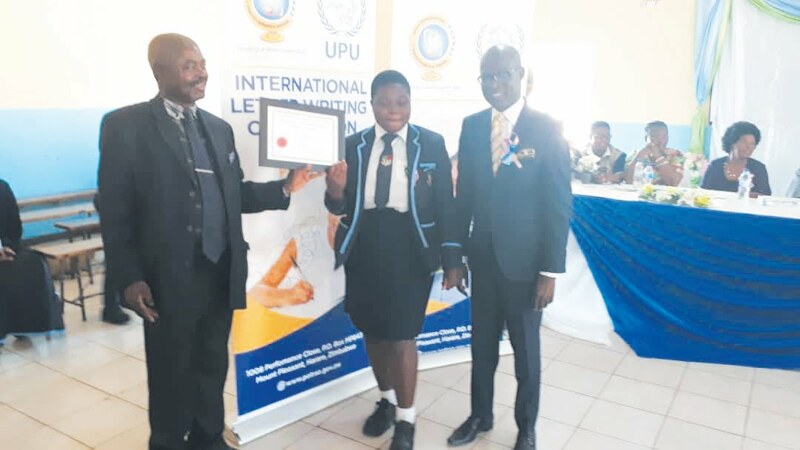 MPANDAWANA - Gutu High School has won three provincial Postal and Telecommunications Regulatory Authority of Zimbabwe (Potraz) letter-writing prizes, following stellar performances by three pupils in the competitions. The competitions are normally done every year and they have been done for the past 46 years under the Universal Postal Union (UPU) accommodating students up to the age of 15. The first prize was won by Laura Nenguwo, the second by Tadiwanashe Rufasha and the third by Fadzai Dondo. The school received 10 laptops, bronze, silver and gold medals and text books valued at $600. The winner of the first prize got $300, text books and a certificate, second winner got $200, text books and a certificate while the third winner got $100, text books and a certificate. Speaking at the prize handover ceremony last week, Gutu High head Mirirai Mutanda said the school felt greatly honoured having its children taking all the prizes in the province. "We feel greatly honoured and our children have made us proud. Nothing is more gratifying than taking the first position in the whole province. This is an exciting moment that does not come all the time. Last year, one of our students worn the third prize so we have been wishing to get more prizes and this has come to pass, it is now a dream come true," said Mutanda. He said the prizes will motivate the school to do more talent-development work to stimulate children's potential. Speaking at the same occasion, Potraz courier services director Kennedy Dewera said by taking all the three prizes, Gutu High had made a great achievement which the school should be very proud of. "It is a huge honour for you Gutu High. Your situation is very unique because in other provinces, it is three schools sharing the prizes. You should keep on working hard," said Dewera.